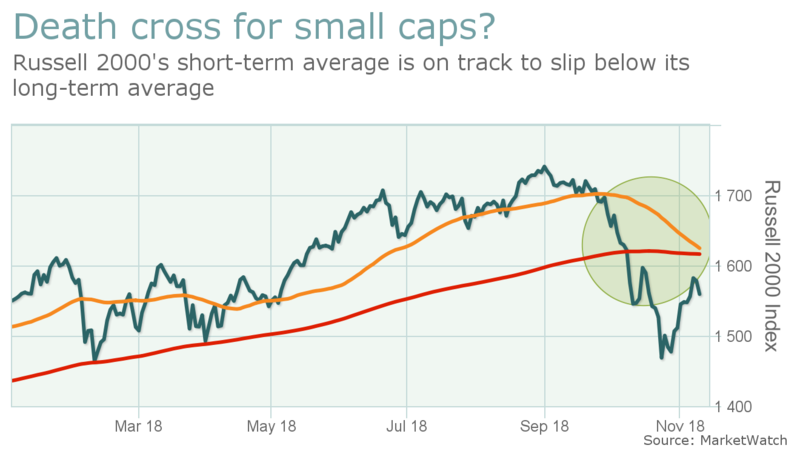 Don’t look now, but a closely followed gauge of small-capitalization stocks is on the brink of a bearish pattern. The small-cap Russell 2000 index RUT, -1.82% is within a few points of seeing its short-term 50-day moving average fall beneath its long-term 200-day moving average, a formation in an asset that many chart watchers believe marks the point that a short-term decline morphs into a longer-term downtrend (see chart attached). According to FactSet data, the Russell’s 50-day moving average is at 1,624.56, while the 200-day stands at 1,616.23, as of Nov. 9. That is an 8.33-point differential, or 0.5%, which means that the Russell 2000, which has been seeing a steady rate of decline over the past few weeks, could see a so-called death cross manifest as early as next week, should the current downtrend hold. Investors piling in to the Russell 2000 drove the index to a 52-week high of 1,740.75 on Aug. 31. The benchmark is now more than 10% below that recent high. The Russell hasn’t been as resilient to recent pains as it in earlier weeks. Its latest decline comes amid heightened concerns about the pace of rate increases by the Federal Reserve and the strength of the global economy. These are factors hitting the broader market. On Friday, with the Russell down 1.8% in afternoon trading, the Dow Jones Industrial Average DJIA, -0.77% and the large-cap S&P 500 index SPX, -0.92% were both falling sharply, threatening to register their worst declines in November after an ugly October period drove the Nasdaq Composite Index COMP, -1.65% into correction territory for the first time in two years and briefly erased year-to-date gains for the other main benchmarks.